Notable as a training ground for Svetlana Kuznetsova, Andy Murray, Ana Ivanovic, Grigor Dmitrov, and others, this well-established academy outside Barcelona essentially focuses on juniors and touring pros; however, it does offer an adult program. There are weekly and weekend options, with from 2 to 4 hours of tennis daily, and the option of one-hour of personal fitness training. Bungalow lodging is available on site, as are a restaurant and bar. 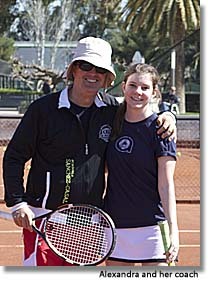 My 16-year-old daughter Alexandra and I attended for the week of 11 March 2013. We stayed in an apartment in Barcelona and went out every morning in the ASC van, departing from Plaza Espana at 7:15 a.m. Alexandra returned departing ASC 5:45 p.m. I returned on a public bus around noon after a 2 hour "Bronze" adult program. The facilities, administration, program, on-site restaurant (excellent food), quality of teaching, maintenance, security, transportation and general tenor of ASC were all very superior. We were an anomaly, as many students ranging from ages 10 to 19 or so spend a year or more, going to the school and playing tennis. 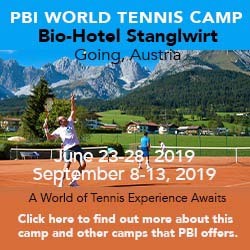 The more serious player/students travel around Europe on the junior circuit. The group is cosmopolitan and international, with students from England, Germany, France, W. Indies, Brazil, Denmark, USA, Russia, Australia, Switzerland, Canada, Italy, China, Japan, and a few Spaniards when we were there. The coaches were also international, those I met came from Argentina, Venezuela, and Spain. Junior Program: The program for Alexandra started with an individual trainer who worked with her for two hours doing physical conditioning related to stamina and tennis movement; really hard work. Interspersed with lunch, breaks, and snacks, the balance of the day was tennis instruction, all one-on-one coaches, and a few intra-student matches. Adult Program: My coach, Daniel ("Dani") Sorribas, Head Course Coach & Adult Program, was an interesting character and seasoned coach, age 54. He stated that he developed the program with Emilio Sánchez 15 years ago based on the "Spanish Method," which has some distinct facets, including the conditioning. Considering the current results—Andy Murray, Rafael Nadal, Fernando Verdasco, David Ferrar, Nicolas Almagro—the Method is well validated. An interesting facet of ASC is the staff development. Every day for an hour or two, all the coaches met and Dani gave them lessons and answered questions they might have about working with the students, Method, or coaching. Thursday at 9 a.m. the temperature was around 50, moderate wind, and a light rain was starting. I thought the prospect of tennis was bleak, but went to the court where I found Dani waiting. We played in the rain until the clay court became too muddy as the rain had increased to a steady, cold, downpour. At that point, he said we should move to a synthetic grass court, which would not be affected the rain, and acquired a new quota of dry balls. We continued the drills and hitting until the appointed 2 hours were completed. The entire time the rain ranged from steady to a drizzle, not stopping. Of the entire 30 courts, there were only 2 players out that morning. Fortunately I had all synthetic cloths with a light pile vest and breathable shell with hood which, with the exercise, kept things surprisingly comfortable. This was some of the most exhilarating and memorable tennis. There were about 30 courts divided between hard and red clay with 2 synthetic turf. Most of the instruction took place on the clay courts. Matches among the students were on the hard courts. The facilities were beautiful, with manicured trees and gardens, pools, several glass paddle tennis courts, a very well appointed gym, riding facilities, a conference center, lockers, a school, dorms. The staff was uniformly professional, courteous, friendly, organized and helpful. The Sanchez-Casal Academy has six apartments on campus, overlooking the swimming pool and academy grounds. Each apartment has two bedrooms, a lounge with TV, a refrigerator, and a bathroom with shower. Apartment guests have the option to add-on half or full board in the club restaurant. Here's what others have had to say about Academia Sánchez-Casal. "I was in Barcelona recently and on my last day there I stayed at the Trypp Hotel (a good decent airport hotel), walked the half mile down a dirt road and took a clinic at the Academy. There were only 2 of us plus the pro but it was fun. The desk staff, courts and amenities at the club were excellent. "I chose this camp both because of the Sanchez-Casal reputation as a training site for pros and because I wanted to visit Barcelona. In a very good way, the experience was not what I'd expected. The program offered (3 levels, I chose "Gold") consisted of 3 hours/day: one in the gym with a trainer (one on one), and 2 on the court, where the usual ratio is apparently 2 instructors/3 students, though when I was there the ratio was 2:2. The quality of both the gym training (and its relevance to tennis) and of the on-court instruction and drills was amazing. ALL of my strokes, including those we didn't cover, have improved markedly, and I'm now looking for a personal trainer because the experience with Marc at ASC was so good. Also, the techniques I have learned seem likely to prevent future injuries. The unexpected aspect was the intensity--I never felt pushed by anyone but myself (encouraged, yes; pushed, no), but I was exhausted at the end of 3 hours (despite being in pretty darn good shape). I didn't try any further tennis beyond drills and in-lesson play, preferring to conserve what little energy I had for touring Barcelona. Massages are available at a very good rate, and there is a very pretty pool area with a poolside bar. On-site food is pretty good, too, and a good value. The instructional and administrative staff all have quite good command of English. I do not have a child, but my fellow camper did, and I observed children in both individual and group instruction. They looked like they were having a very good time. Now the downsides: for those expecting water coolers courtside, there are none. Everyone buys water from a vending machine at 1.5 euros for a liter. Tap water (everywhere in the region) is potable but disgusting. The facility is in the area of the Barcelona Airport, and the hotel in which it is recommended you stay (walking distance from the Academy)is not picturesque (though the staff and services are quite good). That said, transportation to Barcelona is easy to come by--20 minutes to downtown by bus, or you can take the shuttle to the airport and go by train.